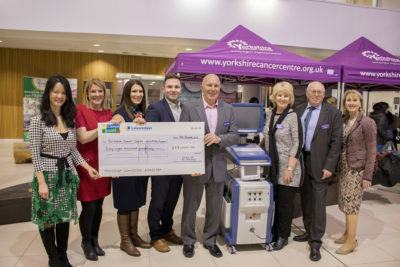 We’re proud to have donated £68,000 to meet a fundraising shortfall needed to pay for a pioneering new cancer treatment at the Yorkshire Cancer Centre. 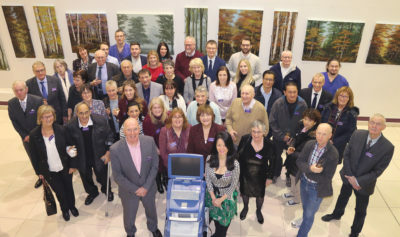 The centre in Leeds, launched a £160k appeal to fund a NanoKnife for their patients in April this year, so they could offer an alternative treatment when invasive surgery was not possible. They managed to raise £92,000 but still had a significant shortfall needed to pay for the device, which uses revolutionary, non-invasive technology for cancer patients. Peter Wilby, Chairman of Caravan Guard and our sister company Wilby Ltd, heard of the appeal from a close family friend whose wife and son have both received treatment at the Leeds Cancer Centre. Their son was successfully treated for a brain tumour a few years ago and worked for Caravan Guard during his rehabilitation. His mum is currently a patient at the centre. A NanoKnife celebration event was held at the Bexley Wing at Leeds Cancer Centre to mark the fundraising milestone. The Wilby family attended the celebration, which included Peter and his wife Nora, as well as their son and daughters, Caravan Guard’s Managing Director, Ryan, and Directors Sally Crofts and Louise Menzies. They were also joined by their friends. Ryan said the family were keen to support the NanoKnife appeal after hearing of the life-saving benefits. The Nano-Knife is used to destroy inoperable tumours in the lungs, kidney, breast, prostate and pancreas. The revolutionary procedure uses special needles to fire electrical pulses into the cancer cell walls, destroying tumours. Yorkshire Cancer Centre Appeal Director Sheila O’Shea was thrilled with the generous donation from the Wilby family, which meant they had now reached their £160,000 target. 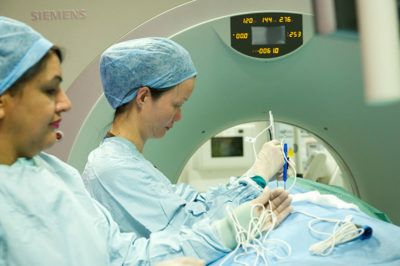 Dr Tze Wah, Consultant Interventional Radiologist leads the team in Leeds, which has already performed 16 procedures on patients with kidney, liver and pancreatic cancers. Caravan Guard and Leisuredays have a strong culture of supporting charitable causes. Each year we donate tens of thousands of pounds to local and national charities, including Overgate Hospice, Heart Research UK and Yorkshire Air Ambulance. In 2015, we donated £42,500 to charity. Every month, staff also chose a national and local charity to donate their weekly “dress down” money to.